QUALIFIED CANDIDATE: Aemetis Inc. used the EB-5 program to develop and construct its ethanol plant in Keyes, California. EB-5 is a nontraditional equity source, but can be explored for certain qualified projects. Funding options are generally best-suited to specific types of projects. The money is out there –– producers just need to figure out which source is the right fit for them. 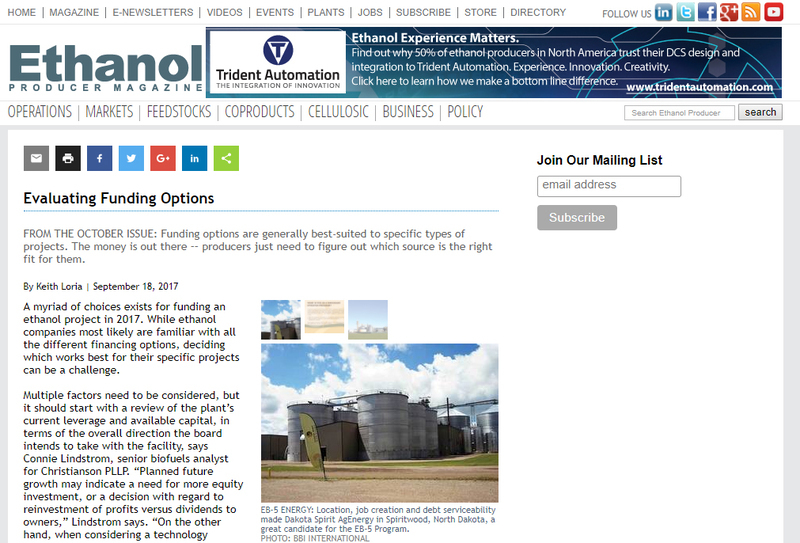 A myriad of choices exists for funding an ethanol project in 2017. While ethanol companies most likely are familiar with all the different financing options, deciding which works best for their specific projects can be a challenge. Multiple factors need to be considered, but it should start with a review of the plant’s current leverage and available capital, in terms of the overall direction the board intends to take with the facility, says Connie Lindstrom, senior biofuels analyst for Christianson PLLP.